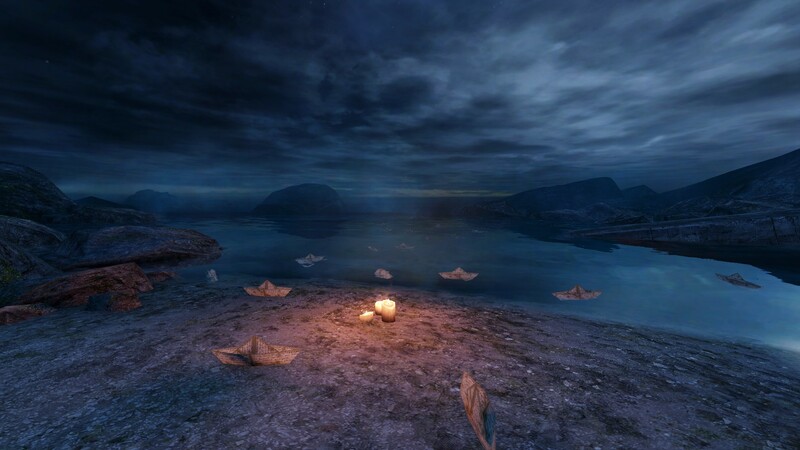 THERE ARE SPOILERS FOR DEAR ESTHER IN THIS POST. 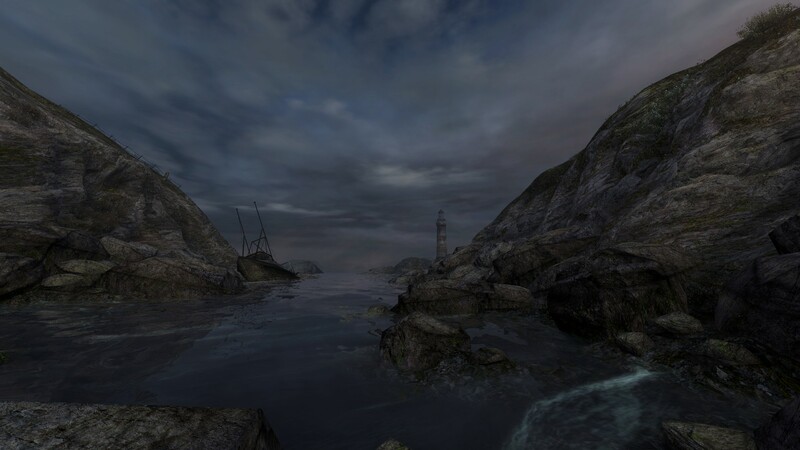 As faithful readers will know, I posted a transcript of the Dear Esther trailer and some thoughts about it a while back. I bought the game on release, and I just finished it a few minutes ago, so I thought that I would write about the game immediately. 1. Dear Esther changes on each playthrough. There are three scripts, and at each moment where the narrator speaks, the game picks from one of those scripts and delivers some text from it. That means that you get snippets from each story, and it really makes each playthrough of the game different. I have only played it through one time, though I plan on doing it more, and this is the story as I understood it. The narrator is named Donnelly. His wife, Esther, was killed in a car accident. Donnelly, sometime after this, goes to an island that has particular meaning for him and his wife. The lines between reality and hallucination begin to blur for him–drugs could be involved. Before the game, Donnelly has done a number of strange things: burning all of his belongings, painting religious quotes and scientific diagrams all over the island, and throwing all of his letters to Esther into the ocean. Along with this, Donnelly is fixated on a man named Jacobson, a man who wrote the original history of the island. Jacobson died on the island a hundred years before, a victim to syphilis, and his infection drove him to mania. Donnelly, an infection from a broken leg spreading through his body, isolated from the rest of the world, makes his way across the island to a giant aerial tower. He reaches it, he jumps off, the game the world fades to black. 2. Dear Esther might not be a game. It uses the infrastructure and rhetorical devices of a video game to tell a crippling, affective story, but it doesn’t have any of the hallmarks of a traditional game. The player isn’t able to interact with the world through the player character, the entire story is told through disembodied narration, and there is only one goal–the end of the game. 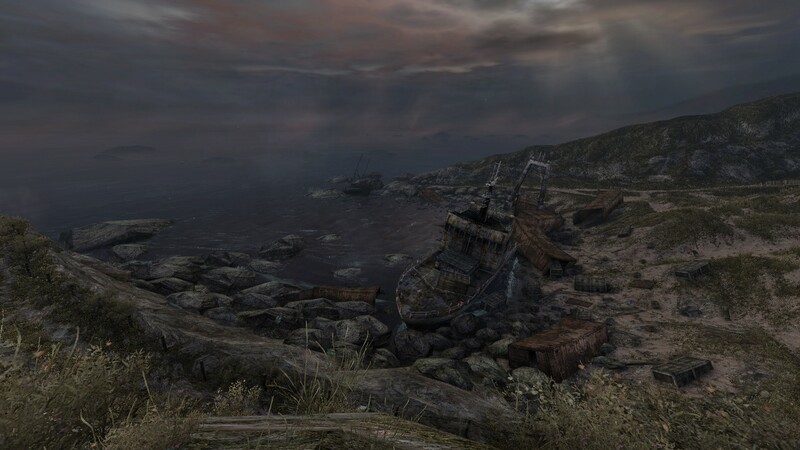 In the same way that a movie or a book plods, inch after inch, to resolution, Dear Esther has a clear end point, literally visible in the first moments of the game, and the player is taken there without deviation. 3. 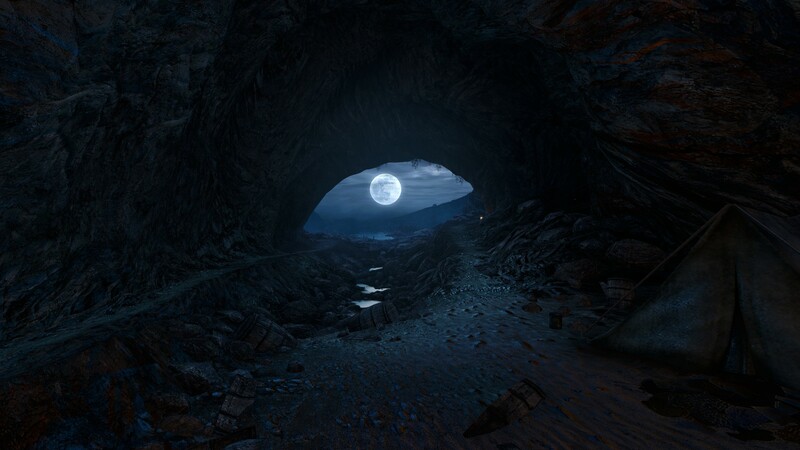 Dear Esther is a game about making the player feel. That is all. There is nothing else that the game is concerned with. The symbolism is heavy handed, the writing purple at times, but the combination of those things with the stunning visuals is really just an effort to make the player understand the emotions that Donnely is feeling. The death of Esther is a blow to his very being, and it (apparently) shatters his mind. I felt deeply complicit in both the guilt that the narrator felt and also in his slow suicide–as soon as I saw the beacon, I knew what would happen. I felt it, and we started the trudge forward. Not that it isn’t interesting, but I don’t see it as a puzzle to be pieced together. 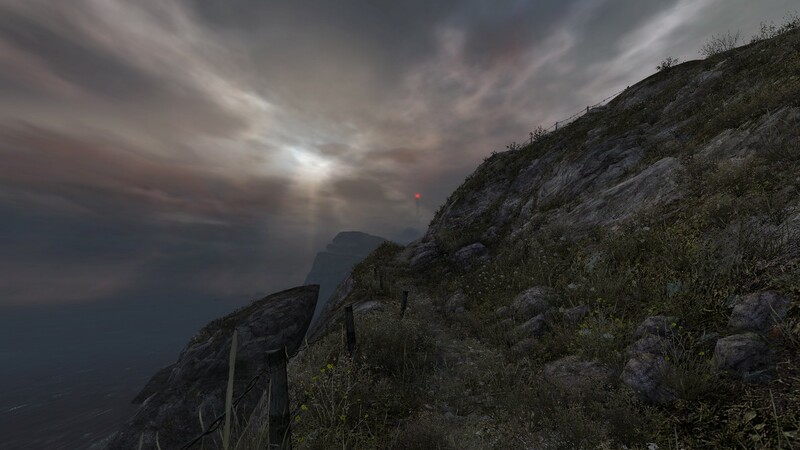 I do not believe Dear Esther is the search for an answer, or even for a meaning. I believe it is an experiment with the senses and the emotions. It is a Lonely, Guilt-Stricken Man Simulator. It is a journey through morbidly beautiful emptiness, a maudlin cocktail of sight, sound, implication and metaphor designed to conjure up a feeling of purposeful despair. And I agree with this, for the most part. The game tries to make you understand what it is like to know that there is nothing left in the world worth caring about. I am resistant to the interpretation of the game that asserts that the whole thing is in the narrator’s mind, that the island is constructed by him, and that it is about an internal journey. I think that, in order to have real, stick-around meaning, the game world has to actually exist. The reason is that there are two narratives going on. One is the player character, his guilt, his mourning, and his suicide. The island characterized as a space of death, of isolation, and of a slow decay, but that is only for the man-made intruders on the island. The lighthouse is ruined. The shacks are abandoned. Ships rot on shorelines. The other narrative runs counter to that, and it is the story of the island. The island, through all of this, is blameless. Though shepherds die and ships run aground on unforgiving rocks, the island stands still as an unchanging haven. The narrator’s life is ruined because of a massive change, the interruptive terror of his wife’s death, but the island could never feel that kind of change. Its beating heart of crystal formations, unmoved for thousands of years, stands monolithic against time. "Bent back like a nail, like a hangnail, like a drowning man clung onto the wheel, drunk and spiraled, washed onto the lost shore under a moon as fractured as a shattered wing. We cleave, we are flight and suspended, these wretched painkillers, this form inconstant. I will take flight." 4. The game presents us with a way of thinking about the separation between health and infection. The narrator, who spoke a lot about infection in my playthrough, is consumed by a psychic pathology–grief, and worse, guilt. He cannot shake it, and because of that, finds solace in a total infection of the body. His body has to match his mind. There becomes a pair bonding of the stained being, an existence that needs to replicate a stained soul with a ruined body. The result is predictably nihilistic–the only result of that is destruction, but on the way to that destruction, there is the recognition of beauty. The interior of the island can never be known without the recognition, and the movement toward, death. This is all pretty Romantic, syphilis-desiring stuff, but it really is the theoretical thrust of the game. Infection breeds death, but also a profound appreciation of the world, and a deep mourning for the loss of it, a loss that can only be truly understood on the way to death. I thought it was pretty beautiful stuff. "I first saw him on the side of the road. I was waiting for you to be cut out of the wreckage. The car looked like it had been dropped from a great height. The guts of the engine spilled over the tarmac. Like water underground." 5. So you should buy Dear Esther. It costs less than two movie tickets, is about as long as that experience, and is infinitely better. The soundtrack is amazing, composed by Jessica Curry, and you would do well to listen to some of the free samples on her website. 6. It looks like thechineseroom, the developers of Dear Esther, have another game they plan on releasing this year. It is called Everybody’s Gone to the Rapture, and I can’t wait to buy it on day one. 7. 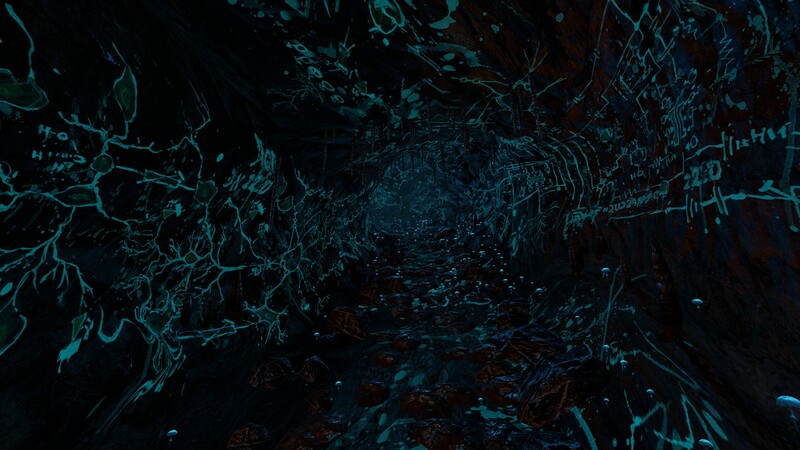 I liked Dear Esther. I want to play more games like it. Cradle looks like it could be really, really amazing. This entry was posted in General Features, Video Games and tagged affect, dear esther, non-game, open world, video games. Bookmark the permalink.